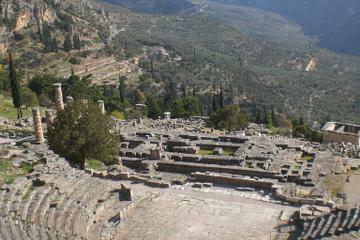 Explore one of the most famous sites of classical Greece in depth on an overnight trip to magical Delphi. Famous for its theater, Temple of Apollo and ancient ruins, Delphi was at the heart of the classical Greek world, and considered the center of the earth and the universe. After taking a scenic drive through Levadia and Arachova (famous for its bright multi-colored carpets), you'll arrive in Delphi. During your visit to Delphi you'll tour the archaeological site and its museum of classical treasures, including the unique bronze Charioteer. You'll then have the afternoon free to spend at your leisure. Next day, continue exploring the wild beauty and grandeur of the ancient ruins, or simply relax in this scenic paradise. The tour doesn't include lunch in Delphi before returning to Athens.